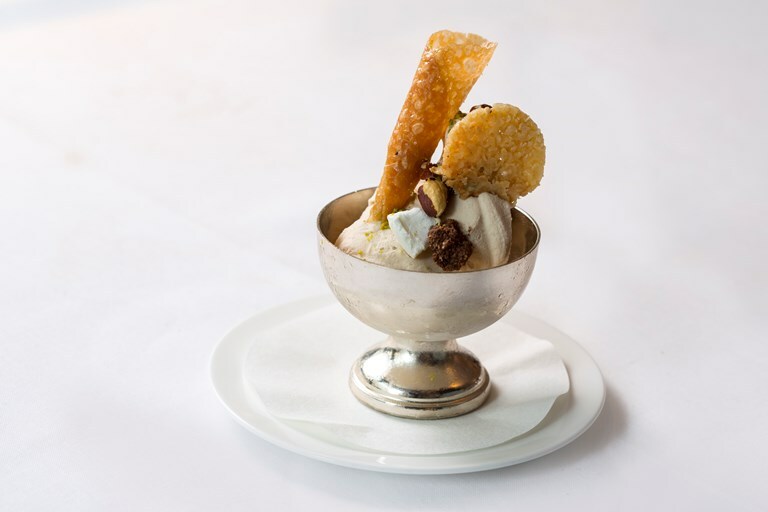 Francesco Mazzei's creamy hazelnut ice cream recipe is served as a sundae with a wonderful variety of crunchy toppings, including pieces of meringue, chopped nuts and chocolate crumble, as well as delicate wafers and tuiles. The ice cream is equally delicious on its own, and is a very traditional gelato flavour in Francesco's native Italy. Once the meringue has cooked and is firm and crisp, remove it from the oven and increase the oven temperature to 160°C/gas mark 3. Leave the meringue to cool, then break into shards and store until ready to serve.